Ha was born in 1956, Volgograd. He graduated at the Gnessin SMPI (Flute Class of Professor Michael Kashirsky and Orchestra Conducting class of Vladimir Ponkin). As a Soloist-Flutist he worked in the State Symphony Orchestra of USSR Cinematography, the Great Symphony Orchestra of the USSR Radio and Television under conducting of Vladimir Fedoseyev and the Academic Symphony Orchestra of Moscow State Philharmonic under conducting of D. Kitaenko, invariably being the sound decoration of these famous ensembles. 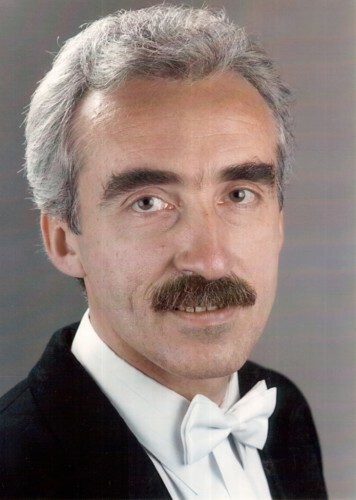 In 1987, Vladimir Kudrya with his Wood-Wind Quintet of Moscow Philharmonic was granted with the title of Laureate of the XVII International Competition in Belgrade (Yugoslavia), and is marked by the Jury as the Best Flutist of this prestigious competition, which brought together the best youth quintets from Europe and America. As a conductor in 1995 in Vienna, Vladimir Kudrya granted the highest award at the IV International Competition of Symphony Conductors, where he was awarded with the I Prize and the Prize for the Best Interpretation of Compulsory Composition. The competition was attended by more than 40 conductors from more than 25 countries. In 1995 - the Musical Director and Chief Conductor at the Gala Concert on Red Square in Moscow dedicated to the 50th Anniversary of Victory. In 1997 - the Musical Director and Conductor of the Gala Concert dedicated to the 850th Anniversary of Moscow. Vladimir Kudrya is a founder and organizer of the first ever Russian Orchestra of Flutes - a unique youth creative team with the most varied music repertoire from the Renaissance to the present day. He is the author of many transcriptions, arrangements and orchestrations. He is an instructor and a visiting professor at the Seoul Conservatory Flute Class, since 2009 - visiting professor at the Vienna International Academy. He conducts intensive concert activity. He cooperates with many Chamber and Symphony Orchestras in Russia and abroad. He has toured several times in Japan, USA, Canada, France, Switzerland, Austria, Germany and other countries. He collaborated with well-known Russian composer Georgy Sviridov, Andrey Eshpai, Edison Denisov, Alfred Schnittke, Sofia Gubaidulina, Boris Tchaikovsky, Rodion Shchedrin, as well as foreign authors Lloyd Weber, Nils Olsen, Lawrence Smith and many others. He also performed for the first time in Moscow a number of flute works composed by E. Bozza, A. Jolivet, P. Sankai, K. Bolling, which then become part of the repertoire of many Russian flutists. He recorded a lot of music for radio, television, film and CD. Music for the best domestic films and cartoons; all symphonies and ballets of Tchaikovsky, Symphony of A.Glazunov, Scriabin, Shostakovich, works by Mussorgsky, Glinka, Borodin, Rachmaninoff and much, much more. He performed more than 2500 concerts on best world stages as the Orchestra solist, conductor or single flutist. Among his students were awarded 27 Laureates of National and International competitions in Berlin, Paris, Bucharest, Athens, Kiev, Lvov, Vilnius, Funchal (Lake of Madeira, Portugal), Jyväskylä (Finland), Bergen (Norway), "Leonardo de Lorenzo" (Italy) in Moscow and St. Petersburg. Graduates of the Vladimir Kudrya Class adorn the best Russian orchestras: Bolshoi Theatre Orchestra, National Philharmonic Orchestra under conducting of Vladimir Spivakov, Moscow Philharmonic Orchestra, Chamber Orchestra «Musica Viva», as well as foreign ensembles: Orchestra of the Hamburg Opera, the ARD Youth Symphony Orchestra, Seoul Symphony Orchestra and a number of other ensembles. "This Musician skilfully combines in his peformance intellectual heritage with opened emotionality, rejoices in glamorous flute sound, having fine sense of the different performing styles" (journal "Soviet Music" No. 10, 1987).